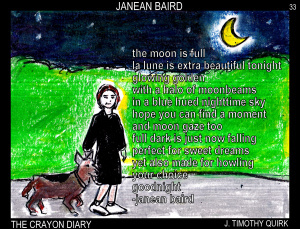 #33 in The Crayon Diary’s Our Stories series is about Blue dog and me. 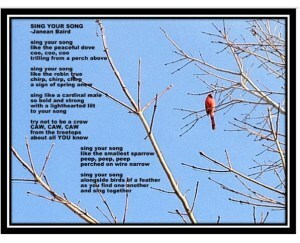 Thank you, J. Timothy Quirk for creating this portrait in art and words. Janean Baird is part of “Team Awesome” a group of friends who met on Twitter. Although we were from different parts of North America (friends in Canada, in central NY, in western NY, in Alabama, Janean’s from Illinois and I’m in CT) we formed a tight knit supportive community. After you see her work LIKE HER TURQUOISE TANGLES FB PAGE HERE! In 2012 I created a format to showcase some of the talent our team had and called it the “Collected Works of Awesome”. You can find it on SCRIBD here! 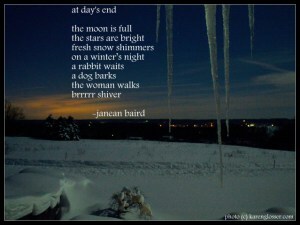 This is Janean’s poem (and photo).